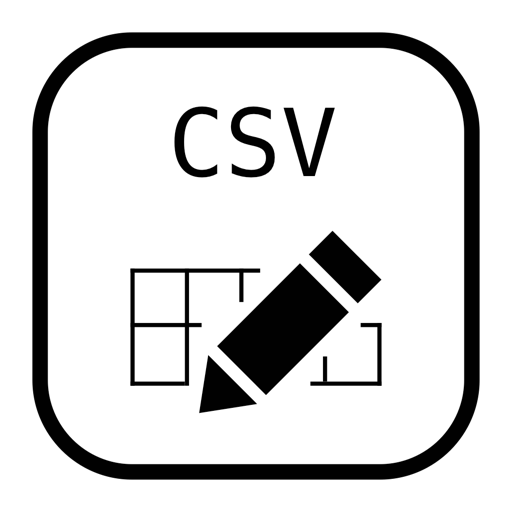 Easy CSV Editor is a must-have editor for CSV and TSV data files. In a clean and user-friendly interface, it offers simplicity and flexibility to edit both small and large documents. • Open, create, edit and save CSV/TSV documents even if they are not properly formatted, like don't have the same number of fields in each row! • Merge the selected cells or event entire columns. There are multiple options which lets you configure how the merge is performed! 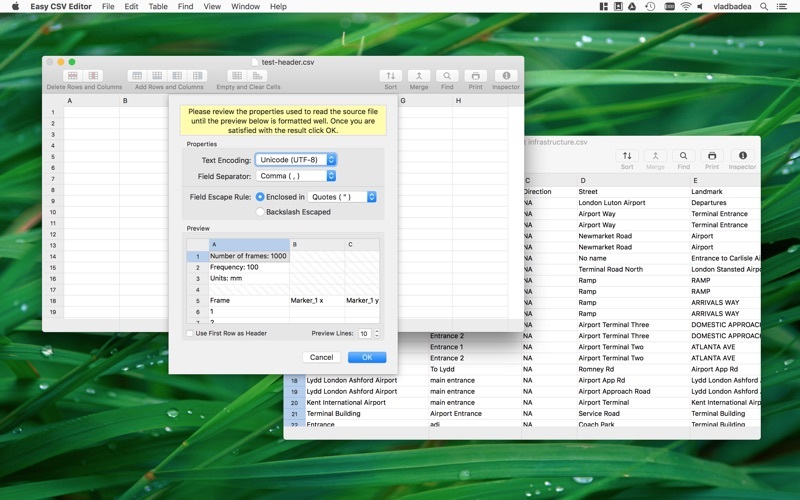 • Use "Clear" menu item to "cut" the last fields from a row (or even entire rows!). This way you can produce beautiful headers for your documents, without the usual clutter produced by the field separators. 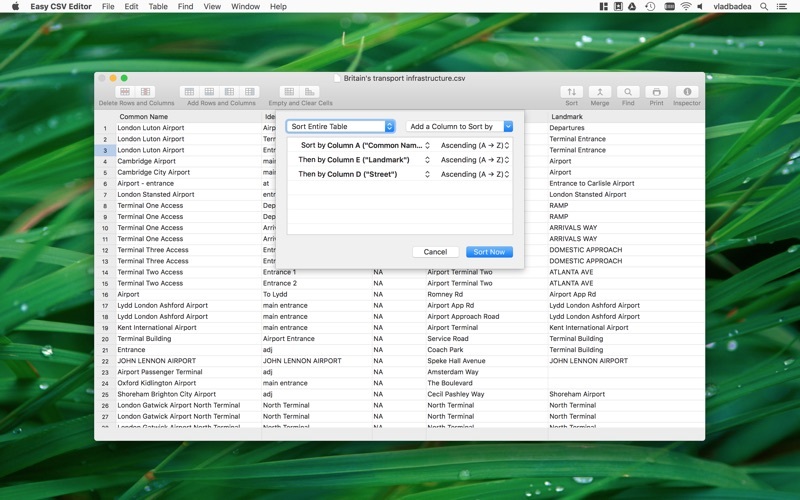 • Auto-detection of CSV format, while providing you the option to adjust the detected parameters. • Select a group of cells to copy, cut or clear. This is in addition to selecting entire rows and columns! • Quickly visualize and change the properties of an opened document - just hit CMD + I or tap "Inspector" button in the toolbar. • Use first row from the CSV as table's header. • Contextual menus for selected cells, column headers or row numbers. • Select a range of columns or rows by clicking the first column/row header in the range, and then hold down Shift key while you click the last column/row in the range. • Change the width of individual columns by dragging the column separators. • Double click the column separator so the column to the left to resize its width to fit the content. • Quickly jump to a row - just hit CMD + L.
• Quickly jump to the cells which are selected - just hit CMD + J. • Preferences - among other things you can change the visibility of gridlines, headers, footers and line numbers. • Print - among other things you can customize if the headers and line numbers are printed or not. • Tabs support (starting from macOS Sierra) - just hit CMD + T to create a new tab in the current window. 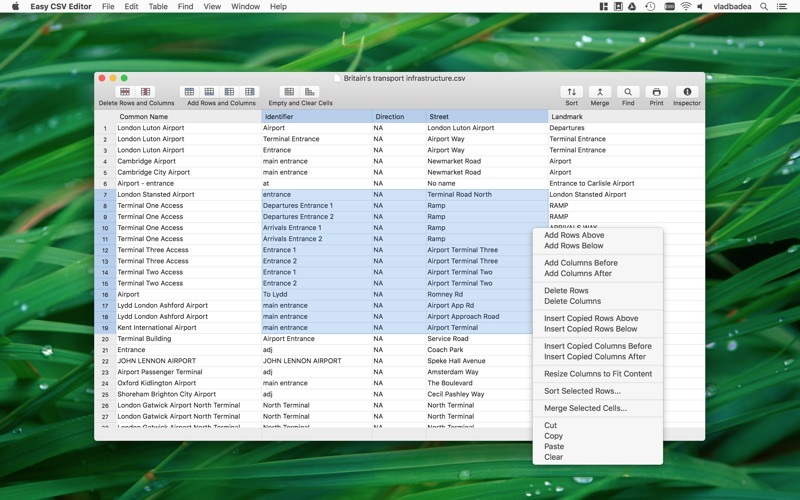 • The application now supports the merging of cells or event entire columns. There are multiple options which lets you configure how the merge is performed. "Merge" option is available on the toolbar, when right clicking on selected cells or column header, and in the main menu. • You can select a range of columns or rows by clicking the first column/row header in the range, and then hold down Shift key while you click the last column/row in the range. • Saving or closing a document while editing a field now works as expected - the edited field is saved to the file or the prompt "Do you want to save the changes..." is shown. • Added "Help -> Release Notes" menu item to be easier to check what's been implemented in previous versions of the application. • Fixed an issue where certain files failed to be opened even though they looked fine in the preview. • The "wrap around" HUD, used for text finding, is now properly centered in the window.